Forty-seven-year-old Lisa Linton still feels a little sheepish for pulling off Salty Sam's trademark faux mustache about 40 years ago. Back then a "tiny little one" visiting the "Captain Jinks Show" with her Brownie troop, Linton said she didn't know any better. "Of course, when I got home, my mom kind of scolded me," she said with a chuckle. Linton said Salty Sam and Captain Jinks were, in the eyes of her 7-year-old self, real sailors whom she was in awe to be able to see live with her Brownie troop. On her visit to the show, she said she was looking around for the boat. "You really thought they were on the USS Albatross," she said. 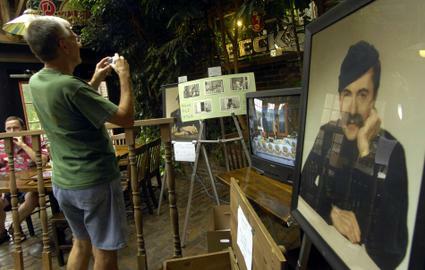 Linton joined dozens of other childhood fans who came to share memories and money during a fundraiser Thursday at Kelleher's Irish Pub. After word got out recently that Salty Sam, known in real life as George Baseleon, was laid to rest in an unmarked grave at Springdale Cemetery, the scores of one-time childhood fans came out to give their friend a proper send-off and raise at least $1,000 for a fitting grave marker. "Isn't it amazing a person so poor in money could be so rich in friends, even 20 years after he's gone?" mused Jim Becker, 63, who said Salty and the Captain had chemistry "that was just beautiful." "Those kind of people in Peoria should always be remembered," he said. Baseleon's cousin, Gus Baseleon, said he got goose bumps seeing the turnout Thursday. Some decked out in sailor hats, they shared laughs from the joke bucket or memories of gifts won from the treasure chest. Pat Sullivan was moonlighting as Salty Sam, and the "Markley and Luciano Show" rattled off live banter just as Baseleon and Stan Lonergan, as Captain Jinks, did years ago. Many of the baby boomers Thursday recalled rushing off the school bus to catch the program, which ran live on WEEK-TV every afternoon from 1956 to 1972 and again as a taped show from '79 to '83. Among them was Canton native Jeremy Krock, who would catch the show as he folded newspapers before his route. "It was just part of your life," he said. 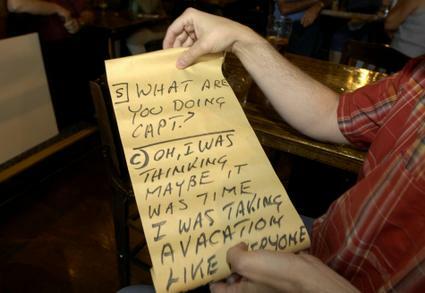 "You watched Captain Jinks before you did your homework, or when you folded your papers." Krock brought along a bicycle he won from the duo in 1967 during an event in his hometown. "It meant so much to meet the guys," the now-50-year-old Peorian said, looking at the black vintage bicycle. "It was so important, I've kept it for 31[sic] years." The fundraiser also was a reunion of sorts for crew members and impromptu members of Jinks' crew. 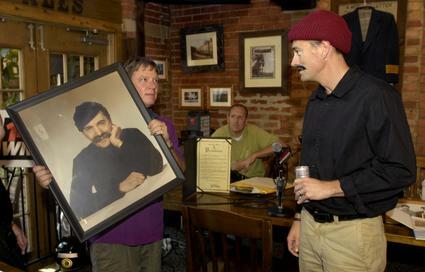 Journal Star Online Director Joe McGuire was thrust back into fame for one more night as strangers affectionately patted him on the shoulder, greeting their old pal, "Bosun Joe." McGuire went from being a fan of the show as a child to a regular fixture during its second phase as the show's artist. "Guess like crazy, Guess like there's no tomorrow, Guess like your pants are falling off," McGuire recited - recalling his old introduction to the Pictionary-like segment. He said it was strange to see how much people remember about a show that's been off the air for more than 20 years. Much of that is credited to Salty and Jinks, he said. "They held that thing together, and kids just loved them." A script from the show written in large letters for prompting during the show taping. A fan checks out Salty Sam memorabilia.